the sounds heard on the surface of the chest in the heart region; they are amplified by and heard more distinctly through a stethoscope. They are caused by the vibrations generated during the normal cardiac cycle and may be produced by muscular action, valvular actions, motion of the heart, or blood passing through the heart. The first heart sound (S1) is heard as a firm but dull “lubb” sound. It consists of four components: a low-frequency, indistinct vibration caused by ventricular contraction; a louder sound of higher frequency caused by closure of the mitral and tricuspid valves; a vibration caused by opening of the semilunar valves and early ejection of blood from the ventricles; and a low-pitched vibration produced by rapid ejection. The second heart sound (S2) is shorter and higher pitched than the first, is heard as a “dupp” and is produced by closure of the aortic and pulmonary valves. The third heart sound (S3) is very faint and is caused by blood rushing into the ventricles. It can be heard in most normal persons between the ages of 10 and 20 years. The fourth heart sound (S4) is rarely audible in a normal heart but can be demonstrated on graphic records. It is short and of low frequency and intensity, and is caused by atrial contraction. The vibrations arise from atrial muscle and from blood flow into, and distention of, the ventricles. Abnormalities in Heart Sounds. Decreased compliance of a ventricle is characterized by a gallop or triple rhythm. Accentuation of the third heart sound (protodiastolic or ventricular gallop) is caused by the filling of a poorly compliant ventricle with blood under high venous pressure. A presystolic or atrial gallop is an accentuated fourth heart sound and is also caused by blood filling a poorly compliant ventricle. Merging of the third and fourth heart sounds is called a mesodiastolic or summation gallop. A very rare abnormality in which four heart sounds are heard distinctly is called a “locomotive” rhythm. Heart Murmurs are sounds other than the normal heart sounds emanating from the heart region. They are often heard as blowing or hissing sounds as blood leaks back through diseased and malfunctioning valves or as blood is pushed through narrowed or stenotic valve orifices. 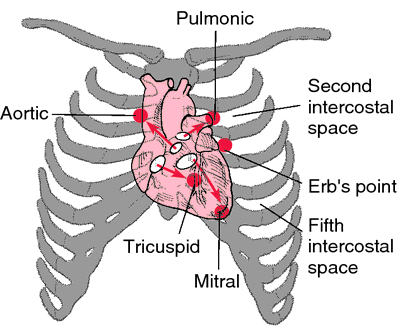 Precordial locations for cardiac palpation and auscultation of heart sounds. Closure of the mitral and tricuspid valves produces the S1 heart sound; closure of the pulmonic and aortic (semilunar) valves produces the S2 sound. From Polaski and Tatro, 1996.
the noise made by muscle contraction and the closure of the heart valves during the cardiac cycle. See: first heart sound, second heart sound, third heart sound, fourth heart sound. The sounds heard with a STETHOSCOPE applied over the heart. The most prominent sounds are caused by the closure of the heart valves. Heart abnormalities, especially valve disorders, cause additional sounds, called MURMURS. The timing and characteristics of these give much information about the state of the heart. The two sounds heard on listening to the heart with a stethoscope (auscultation) during normal cardiac contraction. The first (heard best at the apex) is due to the closure of the two atrioventricular valves (mitral and tricuspid); the second (heard best at the base of the heart) marks the closure of the aortic and pulmonary valves. Two components of the second sound can be heard separately (split heart sound) as a normal feature. Additional heart sounds (third or fourth) may be a sign of cardiac disease. See also cardiac cycle. Noises made by muscle contraction and closure of heart valves during cardiac cycle. the sounds heard on the surface of the chest in the heart region. They are amplified by and heard more distinctly through a stethoscope. These sounds are caused by the vibrations of the normal cardiac cycle. They may be produced by muscular action, valvular actions, motion of the heart, and blood as it passes through the heart. 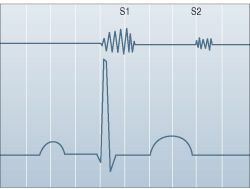 The first heart sound (S1) is heard as a firm but not sharp 'lubb' sound. It consists of four components: a low-frequency, indistinct vibration caused by ventricular contraction; a louder sound of higher frequency caused by closure of the mitral and tricuspid valves; a vibration caused by opening of the semilunar valves and early ejection of blood from the ventricles; and a low-pitched vibration produced by rapid ejection. The second heart sound (S2) is shorter and higher pitched than the first, is heard as a 'dupp' and is produced by closure of the aortic and pulmonary valves. The third heart sound (S3) is very faint and is caused by blood rushing into the ventricles. the heart sounds are normal in outline but muffled, due usually to the presence of fluid between the heart and the stethoscope.